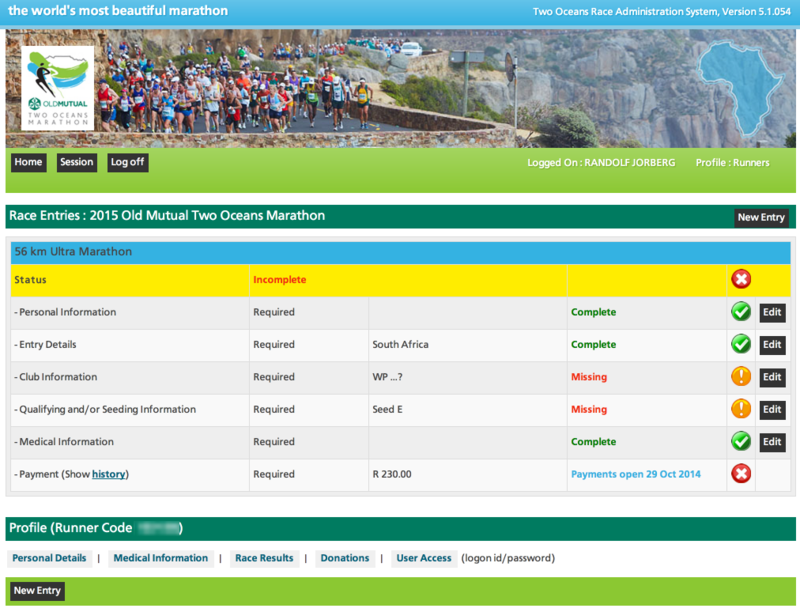 Online entries for the 2015 Two Oceans Ultra Marathon open at 10am on Wednesday, 29 October 2014. The 46th Ultra Marathon will take place on Easter Saturday, 4 April 2015, and the entry limit of 11 000 runners is once again expected to be reached. 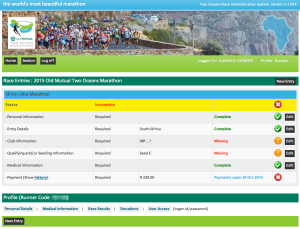 Entries for the popular Two Oceans Half Marathon are only opening from the 13 November or 19 November 2014 for general entries. To qualify for participation in the Ultra Marathon, runners must have completed at least one full marathon (42.2km) after 1 July 2014 in under five hours. However, runners do not have to pre-qualify to enter and can submit their qualifying times at a later stage. South African Ultra Marathon entrants are also required to belong to a registered running club and have a valid running licence. No temporary licences will be issued to Ultra Marathon runners. In addition to the prize money that can be won by the Ultra Marathon winners, title sponsor Old Mutual has once again issued its R1 million challenge to the winning male and female runner who respectively breaks the record for the 56km Ultra Marathon in 2015. The men’s record of 3:03:44 was set in 1988 by road running legend Thompson Magawana, while Frith van der Merwe set the women’s record a year later in 1989 when she ran 3:30:36. The closest any runner has come since then is Zimbabwean Marko Mambo, who ran 3:05:39 in 2005, and who has won the race three times. Russian Olesya Nurgalieva ran the second fastest women’s time in 2008 when she crossed the finish line in 3:34:53. This will be the 16th year that Old Mutual sponsors this prestigious road race. In an effort to alleviate pressure on the online entry system, and to give runners a fair chance to enter, the organisers are introducing an online queueing system as already used by the likes of Computicket and the Cape Town Cycle Tour. The Half Marathon is limited to 16 000 entries. Blue and Light Blue Number holders may enter from 10am on 5 November 2014 (by invitation only). Runners with valid SA running club licences may enter from 10am on 13 November 2014. General entries will open at 10am on 19 November 2014. Entries will be limited during these three entry waves to ensure that everyone gets a fair chance to secure their spot at the start line. Entries into the popular Trail Runs (10km & 22km) will open at 10am on 4 December 2014. Trail entries are limited and sold out within minutes in 2013, and it is expected to happen again this year. Entries to the Fun Runs that take place on Friday, 3 April 2014, will open on 24 November 2014 and close on 22 March 2015. Tsepo Ramonene possesses the usual marathon runner’s physique, a modest height with a slight frame and no body fat to be seen. It’s no wonder he has to wear multiple layers of t-shirts and jackets to keep warm, winter in Lesotho can be bitterly cold. When you first meet Tsepo you soon get the sense that he will not be asking many questions. He is a very quiet and humble young man and after learning more about his situation and where he is coming from, you can see the reason for his timid persona. When you asked Tsepo what he does, he simply replies, “I run”. Running is Tsepo’s life. Both his parents are unemployed. His dad receives a very small pension from working in the mines, but not enough to support the family. Tsepo is the sole breadwinner he feeds his family with the small winnings he earns from his races. His parents are proud of his achievements so far and they know when he goes to a race he will return with something. The current marathon world record is 2h:03min. Tsepo’s personal best is 2h 16min, within Olympic qualification standard. This shows great talent and potential considering his age. At the age of 20 he has plenty years ahead of him to develop his talent. With the right support, coaching and nutrition Tsepo could be a world champion. Before a race he eats white bread with tea. His gradmother sometimes gives him R50 from her monthly pension which he uses to buy energy drink sachetts. Tsepo’s wish is to finnish his schooling. He has only completed primary school. As his parents couldn’t afford to send him to high school which is about R1500 a year in Lesotho. His dreams are to have a proper home and one day build a house for his family. Tsepo will be competing in the London Olympic marathon. 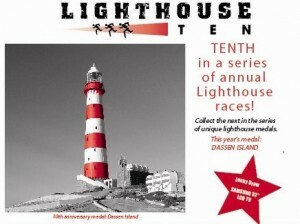 I am happy to see that the Lighthouse Ten run is going to happen for the tenth time in 2012, as it was my first road race ever that I participated in in 2010. 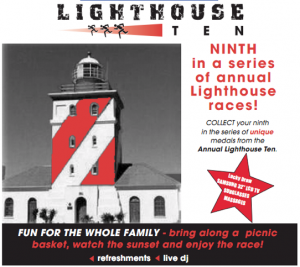 The 10km Lighthouse run takes place on Wednesday, March 7th, 2012 along the Sea Point promenade at 6:15pm. Runners are advised that the start and finish point has moved from the lighthouse to the lawns near Rocklands Beach, opposite the SABC studios in Beach Road. The fast and flat route follows a 10km loop along the Sea Point promenade and is perfect for those wanting to post a personal best, or for those just looking for a fun evening jog or walk next to the ocean. The event starts at 18h15 and participants can enter on the day from 16h45 onwards. Entry costs R30 for licensed runners, R45 for unlicensed runners, while juniors will pay R15 if they have a licence and R25 if not. This year’s medal depicts the lighthouse on Dassen Island and will be handed out to the first 2 000 participants. There are also some great lucky draw prizes including a 32-inch flat screen TV. Supporters, spectators and families are encouraged to bring a picnic, watch the sunset and enjoy the race. Over 2000 runners are expected to complete the popular 10km run and collect this years medal. A refreshment tent and a live DJ will keep the spectators entertained as they cheer their loved ones along as the sun sets on the horizon. Registration opens at 4:45pm on Wednesday, 7 March. 1. Race starts and finishes at on Sea Point Main Road on Rocklands Beach, opposite the SABC Building. 2. Participants must be 15 years or older on race day. 3. Licensed club members must wear their 2011 licence numbers on the front and back of their vest. any younger category down to senior. 6 Juniors (born 1992 or later) will count towards open team prizes, provided they wear club colours and J tags. 7 Club colours must be worn to qualify for team prizes. 8. Traffic officials and marshals must be obeyed at all times, failing which disqualification may follow. 9. There will be 3 water points on the course and Coke at the finish. 10. Race entry cards to be worn and be visible for the duration of the race. 11. Registration from 16h45 on day of race only. age group, wear the appropriate age tags and provide proof of age. 13. Official cut off is 1 hour 30 minutes. 14. Prize giving will start at 19h45. 15. No personal seconding will be permitted except at official refreshement stations. 16. Each kilometre will be marked. loss, damage or injury to participants. 19. Medals will be handed to the first 2000 finishers. for any loss. Do not leave valuables in your bag. 21. Social walkers welcome, but due to the nature of the route, we regret no prams or wheelchairs are allowed. I’m back to running in Cape Town and I just signed up for my first Marathon to be run in South Africa. Last year I ran my first Half-Marathon at the Peninsula Marathon 2011 and this year I’ll go double the distance I completed my first full Marathon at the legendary New York City Marathon in November! The Peninsula Marathon is back on the faster traditional route that runners have grown accustomed to over the years after race organisers were forced to introduce a new marathon route for 2009 and 2010 to avoid the construction around the stadium. The marathon will start on February 19th in Green Point, opposite the Cape Town Stadium, while the half marathon will start in Bergvliet. Both routes take runners along the Main Road through to the finish at the Naval Sports Grounds in Simonstown. The Peninsula is always a popular event with local runners, as it is an official qualifier for the Old Mutual Two Oceans Marathon and many use it both to qualify and as their long training run. 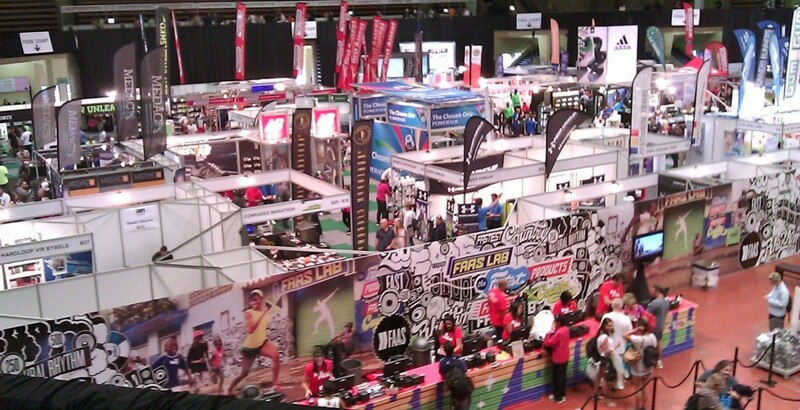 Enter the Peninsula Marathon on topevents.co.za. Closing date for entries is Friday 10th February 2012! The deadline for online entries for the Cape Town Marathon 2011 is fast approaching with Monday September 12 the cut-off date for pre-entries to the 42.2km and 10km races. The Marathon, which takes place on Sunday 25 September, has a flat and fast 42.2km route which starts in Adderley Street at 06h30 and takes runners out to Rondebosch before looping back to the new Green Point Urban Park via Salt River, the Foreshore and the Sea Point promenade – showcasing Table Mountain, the ocean and many of the major attractions Cape Town has to offer. The race has an extended 8-hour cut off time to give novice runners the opportunity to complete their first 42.2km race. There is also a 10km race which starts in Adderley Street at 06h30 and has a two hour cut-off, so walkers will have ample time to earn their medal. The marathon is expected to attract quality runners as it is the only South African Olympic qualifier for London 2012. 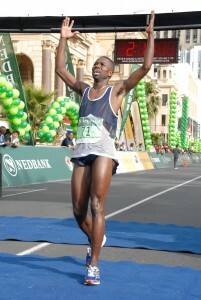 It is also a qualifier for the 2012 Comrades and Two Oceans marathons. The prize money for the marathon winner is R25 000 followed by R15 000 for second and R12 500 for third place. In the 10km race the winner will receive R12 500 with the second runner winning R7 500 and third place R6250. Besides the Marathon and 10km races on Sunday 25 September, the public can enter a 5 x 4.2km relay race aimed at clubs, companies and schools. The relay starts at the Green Point Urban Park at 14h30 on Heritage Day 24 September 2011. There is also a 5km fun run from 16h30 at the Urban Park on Heritage Day. “An event such as the Cape Town Marathon truly highlights the diversity and beauty of our city and its surrounds. We are looking forward to seeing this race go from strength to strength, not only as a race which attracts the world’s best, but also as an event that involves the people of Cape Town,” says Bulelwa Makalima-Ngewana, the managing director of the Cape Town Partnership. Runners can get registration details at the Green Point Urban Park tea room on Friday 23 September until 6pm for the Marathon and on Saturday 24 September for the 10km. Runners should visit www.wpa.org.za for online entries, which close on Monday September 12. 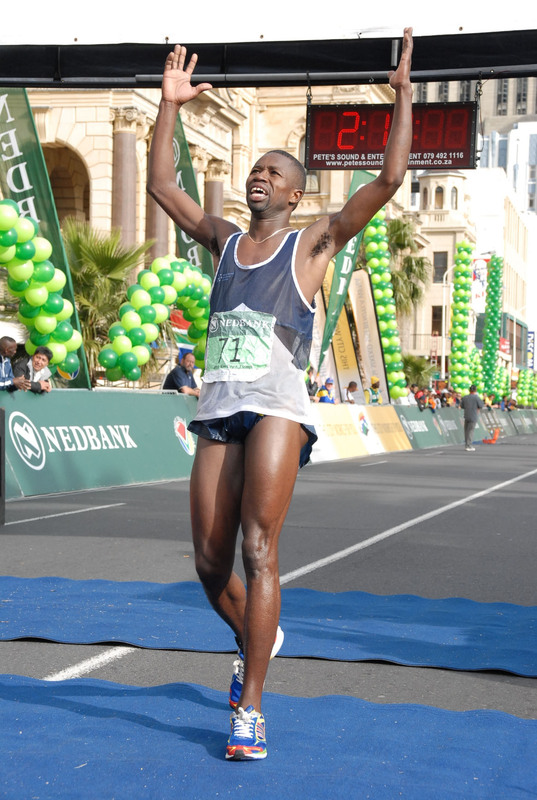 The 2011 Old Mutual Two Oceans Marathon was won by George Ntshiliza from the Eastern Cape, who completed the 56km race in 03:08. Second place went to Motlhokoa Nkabutlane (Lesotho), while Tsokang Maine (Lesotho) finished third to complete the world’s most beautiful marathon podium. The women’s event was won by Oleysa Nurgalieva (Russia), with her twin sister Elena, in second place and Mamorollo Tjoka (Lesotho) claiming third prize. Go for your Run! 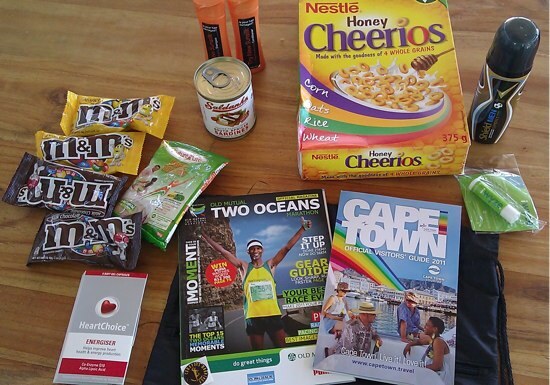 Two Oceans Marathon 2011 is on! 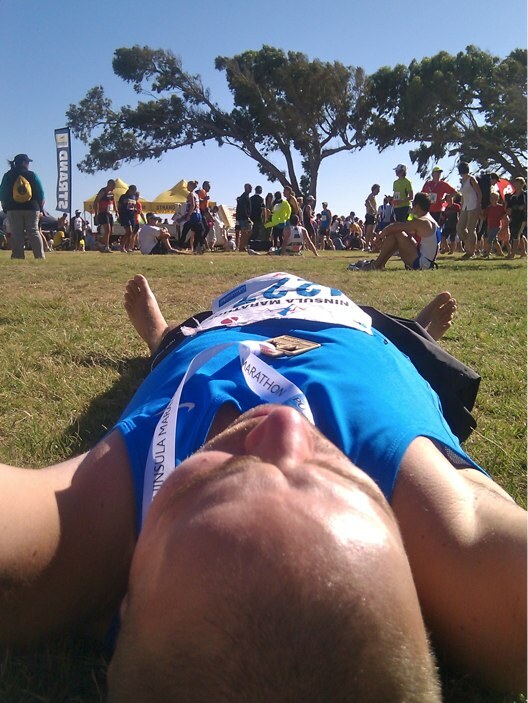 Hopefully you’ve done all your training and are ready to do your best – Two Oceans Marathon in on! The excitement is there and the weather forecast for Cape Town looks like we’ll have perfect running weather with sunny and mild temperatures between 13-24 °C. Have you picked up your Goodie bag? Did you find the same stuff as I did? I wish all runners all the best! Set to kick off on the 19th of May 2011, the UNOGWAJA 2011 will follow in the footsteps of war veteran Phil Masterton-Smith where four young men will attempt the ultimate journey of courage and endurance by cycling from Cape Town to Pietermaritzburg and the following day running the Comrades marathon. Endorsed by the Comrades, the UNOGWAJA 2011 journey will consist of a ten-day cycle totaling 1,730km’s on the saddle and the following day running the world’s ultimate marathon, the Comrades. This epic biathlon will be done in aid of the Amabeadibeadi charities (the collaboration of official Comrades charities). The UNOGWAJA 2011 was created to commemorate war soldier and Comrades winner Phil Masterton Smith (also known as UNOGWAJA – meaning the hare) who in 1933 could not afford the train fare from Cape Town to Pietermaritzburg to take part in the Comrades. He then put himself in the history books by cycling a distance of 1,730km to get to Pietermaritzburg and then raced the Comrades and placed 10th. This ultimate story of passion, will power and triumph is why the UNOGWAJA 2011 was created. The UNOGWAJA team- John McInroy, Paul Blake, WP van Zyl and Lourens van Zyl were joined through Red Sock Friday, an organization that shares its origin, like Comrades in the aftermath of a World War and is a global community of people who share a common passion for life and positive energy. The Amabeadibeadi is collaboration of the five official Comrades charities that all serve to benefit from Comrades and the UNOGWAJA 2011, namely the Community Chest, Wildlands Trust, Sports Trust, PinkDrive and Starfish. The UNOGWAJA team will be running in the colours of the Natal Carbineers, the same colours that Masterton-Smith wore in 1931 when at the age of nineteen became the youngest ever Comrades winner and is the same division that Masterton-Smith died fighting under in the Western Desert in 1942. Team UNOGWAJA have received training and nutritional guidance from the Sports Science Institute of South Africa who have put their weight behind their efforts and put them on a rigorous exercise and nutritional programme to ensure they are at their physical peak for the challenge. The journey will start in Cape Town on the 19th of May and the team along with their Avis sponsored support vehicles will visit various towns on route until they arrive in Pietermaritzburg at Comrades House on the 28th May. “We are doing a callout to the communities in each of the towns that we pass through to come and show us support. We are also going to use this project to uplift these communities by giving local businesses a platform to get involved.” concluded McInroy. You can sms “redsock” to 40021 to donate R20 to the UNOGWAJA. Alternatively you can also donate into the giant donation can that will be traveling with the team. Corporate companies or individuals can “share” a memory and sponsor a kilometer that the team travels. Daily video diary updates will be blogged via RedSockFriday.com and pinkdrive.co.za. I am happy to see that the Lighthouse Ten run is going to happen for the ninth time in 2011, as it was my first road race ever that I participated in in 2010. 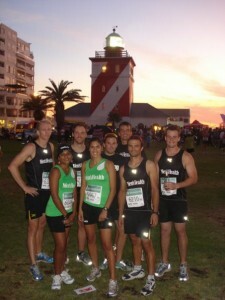 The 10km Lighthouse run takes place on Wednesday, March 2nd, 2011 along the Sea Point promenade at 6:15pm. The lighthouse race starts at the Mouille Point Lighthouse in the direction of the V&A Waterfront. It then doubles back along the promenade toward Bantry Bay before returning to the finish at the Lighthouse. Registration opens at 4:45pm on Wednesday, 2 March. 1. Race starts and finishes at the Mouille Point Lighthouse, Beach Rd, between the V&A Waterfront and Sea Point.